My inner hoarder has been trying to avoid this path. The path that leads to more dishes, dishes I don’t need for everyday eating. 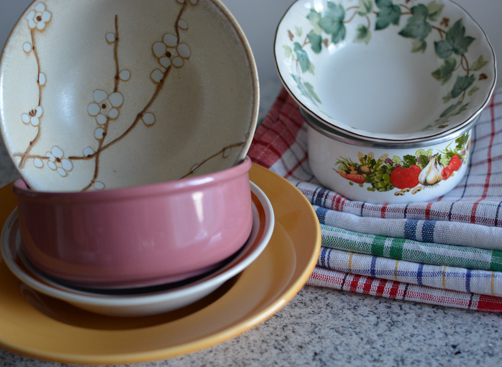 Dishes that are just cute or different from everything I already have—just for the purpose of food styling. A few weeks ago I gave in and told myself, if it needed to be done then it’s going happen on the cheap. I will be a hoarder of props that I will gladly sell one day or give away. 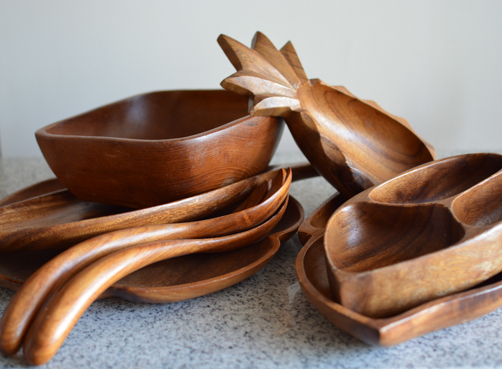 Except these wooden bowls, I really like them. I gave in to all of this because, I’m really working on it this time, the oatmeal book. The baked oatmeal book. See this post and don’t mind the fact that it was almost exactly a year ago. Yikes! It’s okay, I’ve been working on other aspects of the book, like general skills and practice plus a lot of knowledge that gives me more confidence but not all the confidence. That also means I’m quite practiced at procrastination but you feel me don’t you? I know you understand. This particular haul, I gathered in one 3-4 hour period which I feel quite lucky about. I live in an area full of thrift shops, thank you college towns. 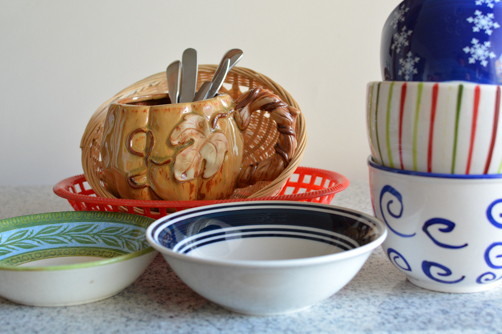 I was hunting for smaller bowls to plate the oatmeal recipes and random inspirations. 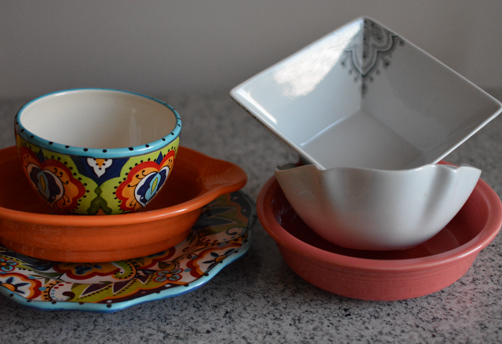 I wanted to find bowls in different colors and designs. Let’s start at Palouse Treasures thrift store. The above items were $11.75. 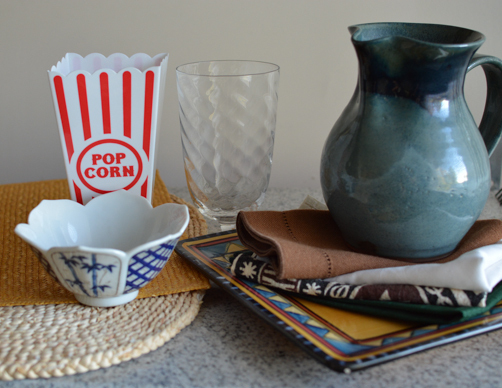 I thought the popcorn tub would be really cute to show off some healthier popcorn snacks and then there are cloth napkins, place mats, a tall glass for green smoothies, an artist made pitcher (only $3.99 – those go for $30-$40 at some places), bowl, and plate. I also found these wooden bowls. They were priced $0.99 each and I thought that was a great deal. When she was ringing me up she told me I was buying the whole set and it was only $3.99. What!?! Woohoo! They had a lot of dried stickers on the bottom that seemed years old but with a lot of elbow grease, real grease, vinegar and that pampered chef stoneware scrapey thing—the gunk came off. They are now good as new. The pineapple one is my favorite! These beauties were from the Salvation Army in Moscow, ID for $11.93. I think this is where I began to notice that blue and white is the most popular dishware color scheme and then I remembered I grew up in a house with blue and white dishes. This is about the time where I took note of how much blue and white I already had and decided to consciously try for a wider color range. 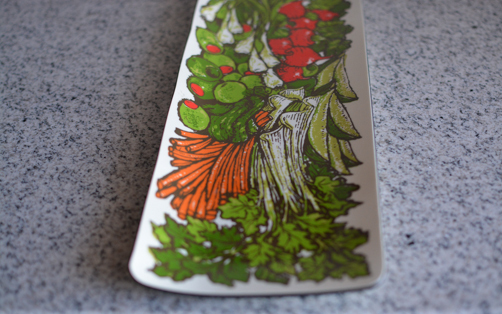 I also found this cute vintage looking serving platter. It’s a little busy but I think it will be fun. Salvation Army was great but it was definitely the most expensive of the thrift stores and they also taped their sets together. I totally understand the set thing but when you’re looking for individual pieces, it’s kind of a bummer. Next up was Goodwill. These beauties were $11.54. You can see I managed to avoid blue and white. The linens are brand new and they were only $0.99 each, quite the bargain. This was the indulgence of the night. I went to Macy’s to check out what they offered and to see what kind of deals or clearance items they had. I didn’t pay full price for anything! I did spend $45 though. The Fiestware and Espana brands were buy one get one free. 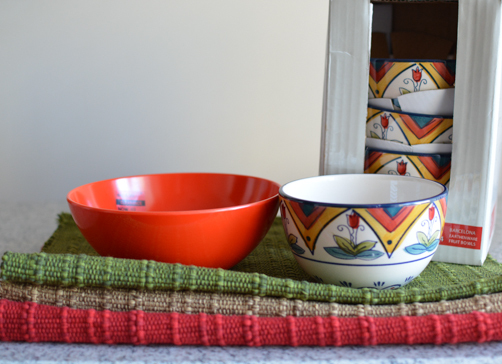 The grey and white square bowl was in the clearance and the ruffled bowl was 40% off. All in all, a few very productive hours. What has been your best thrift store find? Hi Michelle, I do the same thing!! I’ve even been saving stamps at my grocery store, because they’re giving away colorful Rachael Ray dishes!